All in all it’s just another brick in the…. closet door? For today’s Throwback Thursday, I’ll share with you one of the ways I used to exercise my creativity besides writing. When I was fourteen, I loved the band Pink Floyd. My favorite Pink Floyd album was “The Wall,” not necessarily because of the music, but I think because of the amazing double album cover art inside. I started in June of that year, and didn’t finish until December. It was not the easiest painting to replicate because my doors were different dimensions than a double album cover, and they also had panels in the middle that weren’t flat. About three years later, I really wasn’t much into Pink Floyd any longer, but I still planned on keeping my doors as they were the largest art project I’d ever done at the time. However, when my daughter was small, my Grandma was babysitting her once and allowed her to scribble all over them. And a few years later when my birth mom moved in with my Grandma, she painted over them without first asking me if I cared to keep them! Regrettably, I only have one photo of my masterpiece, and that photo is grainy and has a glare. Time to talk: What’s the largest art project you’ve ever undertaken? Would you allow your child to paint a picture on their bedroom wall or door? What’s your favorite Pink Floyd song? Have you ever watched Martha Stewart? She can rip open a turkey and stuff it with her bare hands, then while it’s cooking, she tends to her garden, sews a new dress, and crafts some fancy place settings for her dinner party. But I’m not her. First of all, I refuse to touch a dead bird. Ever. (And in case you’re wondering, no, I don’t eat dead birds ever, either.) I also don’t garden. I’m allergic to just about everything outside and especially grass, so the last thing I like to do is get down in the grass to plant something. I did take home economics in middle school, plus I lived with a grandma who sewed a lot of my clothes, so technically I do know how to sew, but I just don’t like it. And finally, while I do enjoy doing art projects such as making crafts, drawing, painting, etc., I don’t like to keep that stuff in my house. I think it has something to do with my Asperger’s Syndrome, but while I admire and appreciate the artistic efforts of crafts, I just don’t care for that kind of decor in my own home. However, Thanksgiving is the one time a year when I throw caution to the wind and let my hair down. Because in November, I start making my place settings and name cards for our Thanksgiving meal. As many of you know, most of my family doesn’t speak to me, so besides my sister and me, we usually have one or both of my kids, their dates, and a bunch of friends. So for years, it’s been my tradition to surprise everyone with what kind of place card they’ll get. Then afterward, they can be thrown away and I don’t have to keep any of that craft clutter in my house. So while this year’s place card will be a surprise, I’m going to show you some previous years’ work. This time, everyone got a turkey pinwheel. These were a lot of fun, and the pinwheel part was different for each guest and was made with a paper pattern that reflected their own personalities. Almost everyone started blowing them right away, and it was funny to see who got overly zealous and broke theirs before their food was even served. This time, everyone got a pine cone turkey. They seemed like a good idea in my head, but making them was something else. It wasn’t as easy as I would’ve thought to find pine cones that weren’t crushed, and I pricked my fingers a lot while I was gluing the paper feathers in them! Plus, after I made them, I then started fearing they might have bugs in them which would get in the food. This time, everyone got a pilgrim’s hat or bonnet. I also made a sign for the door that said “Ye Olde Pilgrim Cookery – Didst Thou Bring Thy Appetite? Signage By New World Printing Company,” and my sister sewed us both pilgrim dresses. (However, we looked exceptionally dorky, so I won’t be sharing those photos!) We tried to get my son to wear a pilgrim man outfit or even a hat, but he refused to take part in our insanity. Also, we spoke only in Olde English which was pretty fun. Or funny. Or dorky, depending on who came. But most of the guests seemed to like it, or else they were too polite to laugh at us to our face. Either way, we had a good time. So, while I admit I’m no Martha Stewart, she’s no Rachel Carrera either. Let’s talk: What are some of your Thanksgiving traditions? White meat, dark meat, or no meat? What was the last thing you ever made with your hands? Would you ever speak in another accent in front of guests for an entire day? For my throwback Thursday today, I’m taking a break from this month’s game theme and am instead just talking about something fun that’s seasonally appropriate. 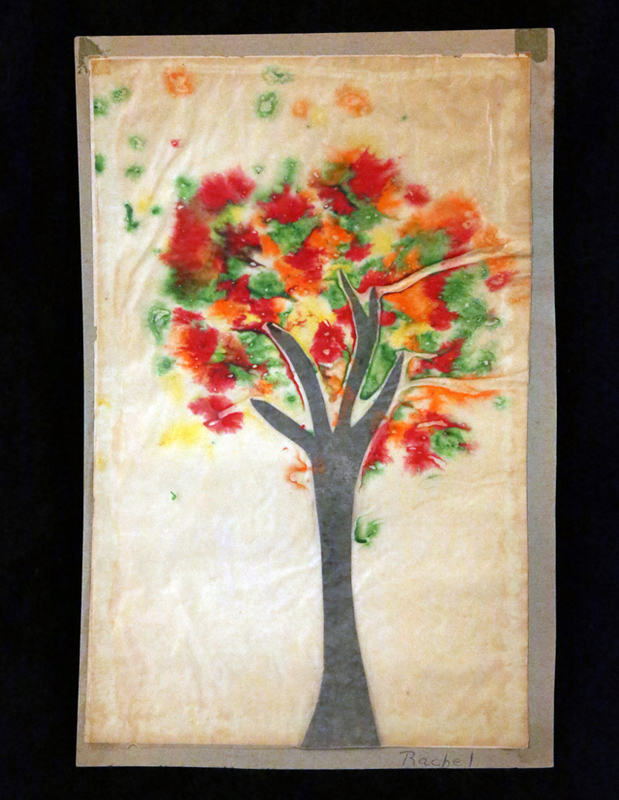 Submitted for your approval, I offer a piece of autumn art I made when I was four years old in kindergarten. My teacher, Mrs. Cook, helped us shave crayons. Then she helped us cut tree trunks out of construction paper, and we added the crayon shavings. She placed a piece of wax paper on top and ironed it in place for us. This was one of my absolute favorite projects as a little kid for several reasons. First, I loved all the colorful leaves. Here in Florida, we get two colors: green or dead. I also loved the look of autumn trees because I loved the shape of Maple leaves. We don’t have trees with much of anything other than the standard football shape leaves here. (Besides orange trees, we have a lot of Oaks.) And finally, I loved making stuff, so using crayons for something other than coloring was an extra special treat. When I got home from making this project, I excitedly told my Grandma exactly how it was made and asked her to help me make another one at home. We didn’t have a regular pencil sharpener. (My Granddaddy used his pocket knife to sharpen pencils.) So, I used the sharpener in the side of my Crayola crayon box, and I made my own shavings. I made a lot of shavings! Then I had a difficult time getting the shavings out. I had to tear apart the box! Of course, I didn’t have any crayons left, so I didn’t need the box anymore anyway. Grandma didn’t have time to help me cut out a tree, so mine didn’t come out nearly as good as the one Mrs. Cook helped with. And finally, we didn’t have wax paper. So Grandma substituted plastic wrap. As you can imagine, the home version of my project went from bad to worse when the plastic melted on Grandma’s iron! She yelled, I cried, and I never got to make another autumn tree. Worse yet, I didn’t have my crayons anymore, and I had to dress in wrinkled clothes! But at least I still have this one to share with you. Happy Autumn!